The DBX VE brings you the best of both worlds, Kyosho's legendary world championship quality and Team Orion's superior performing Vortex brushless system. This isn't just a nitro buggy chassis with a motor. This is a brand new buggy platform from the ground up, strategically placed components achieve optimal weight balance and handling characteristics. The deep stroke 4-wheel independent suspension and full-time 4WD drive-train powered by the Team Orion Experience B/L means nothing can stand in your way. Fully-factory assembled and in a Readyset package for instant off-road excitement. 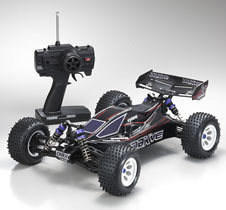 Fully Digital Servo - Equipped with a digital servo for great response. Compatible with DBX/DST - The DBX VE is 60% compatible parts wise to its nitro version, so parts availability is not an issue. New Steering Layout - The DBX VE has a whole new steering layout witch gives you greater response and much more of a steering angle than the DBX gp version. 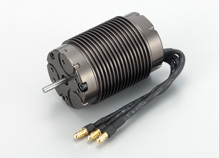 Steel Pinion Gear - The DBX VE is equipped with a strong machine steel pinion gear for added security and durability. 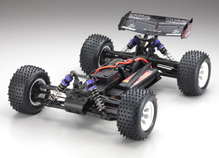 Kyosho's proven design combines a low C of G center shaft 3-differential drive system on a full-time 4WD chassis. 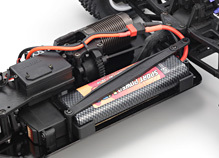 Feel the torque from the included ORION VORTEX 10 brushless motor. Gear backlash can be adjusted with just two screws on the aluminum motor mount. Comes Equipped with ORION EXPERIENCE 2 Pro ESC featuring high speed cooling fan. Switch on and neutral position is automatically adjusted. Features automatic voltage detection. Long span suspension arms create wide tread on a double wishbone 4-wheel independent suspension system. Delivers plenty of stroke and smooth running stability. 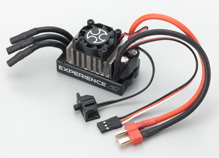 Can be used with 7.2 - 8.4V NiMH or 7.4V - 11.1V Lipo batteries. Simply switch power on and the leave the throttle for setup to complete automatically. Newly developed ball-connected suspension system features fully interchangeable suspension arms and front-rear interchangeable knuckles and shock stays that are also compatible with other DBX series models.